donations: The only Thrift Store we know of that offers and incentive for donating! We can accept donations from 10am-5pm Mon-Sat. Please do not leave donations outside of the store before or after donation hours as they can be stolen, vandalized and exposed to the elements causing them to become un-sellable requiring us to incur disposal costs directly impacting funding for our projects. Additionally, we appreciate your understanding that we may not be able to accept items that we deem unsafe or unsalable. 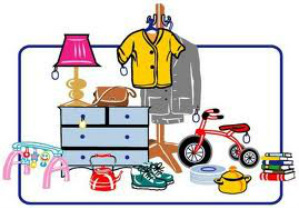 Let us pick up after your Garage Sale so you don't have to!